Workplace Systems, Inc. (“Workplace Systems” or the “Company”), a family-owned business since the 1940s, engages in the design and manufacture of high-quality modular work furnishings, such as laboratory and work benches, for facilities across North America. Workplace Systems offers twelve core product lines and more than fifty add-on accessories to customers across a wide variety of industries, including laboratory instrument and equipment manufacturers, educational institutions, electrical/electronic assemblers, healthcare device companies, industrial machinists, government institutions, and more. Through over 65 years of thoughtful innovation and diligent customer service, Workplace Systems has developed a reputation for progressive, quality products that fit the unique needs of each of its numerous customers. The Company is located in Londonderry, New Hampshire. 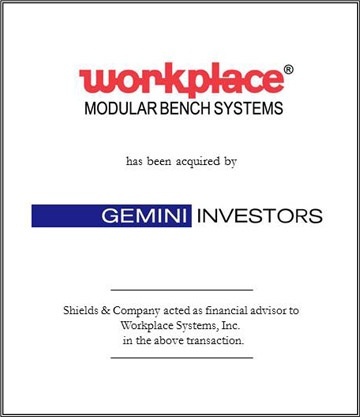 Shields & Company represented Workplace Systems in its sale to Gemini Investors, a private equity firm based in Wellesley, Massachusetts. Shields & Company acted as a financial advisor to Workplace Systems, Inc. in the above transaction.